Facility managers for marinas, yacht clubs, boatyards, condos and municipal walls must make investment choices about the electrical infrastructure that they will install to support their customer’s needs. Systems that provide maximum flexibility in electrical connectivity for boaters are expensive in capital cost and maintenance. In many facilities boaters will encounter more modest wiring alternatives. Wiring configurations will also vary between docks in larger facilities. Different docks at facilities that support a wide size range of both resident boats and transient visitors may be wired differently. Very large boats would normally slip on a dock with other large boats. These docks will likely be powered with only 208V/240V, 50A service outlets. Docks intended for mid-sized boats may have a mix of 208V/240V, 50A outlets and 120V, 30A outlets, or may have only 120V, 30A outlets. Facilities that cater to only transient visitors may have a mix of 30A and 50A outlets, or may have only 20A and 30A twistlock outlets. 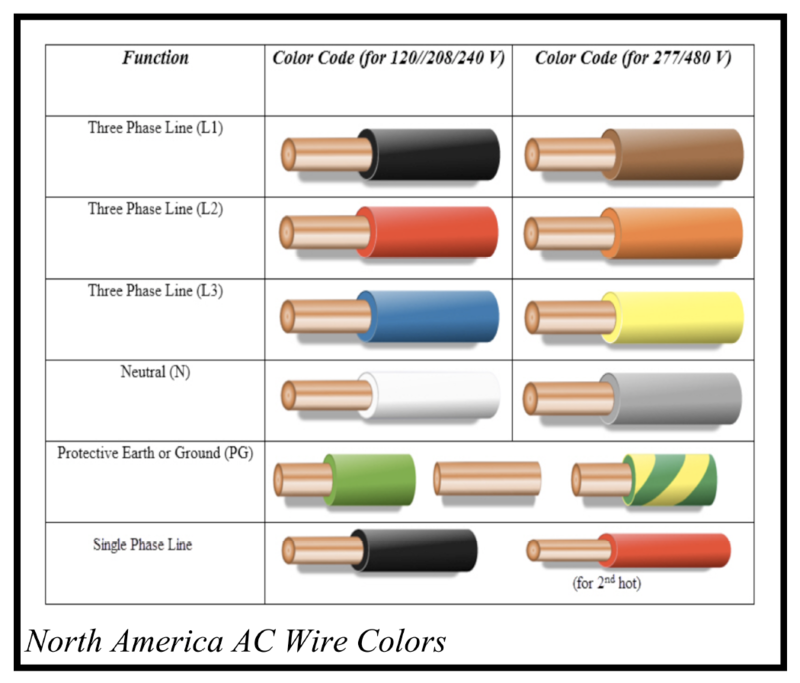 Electrically, there are many possible code-compliant wiring variations. 208V/240V, 50A marine twist outlet. We never encountered a 120V, 2-Pole, 3-Wire NEMA type SS1 50A shore power source; they exist, but are very uncommon. We have encountered NEMA 14-50 (residential 240V, 50A outlets used on electric range/ovens and kilns) in various places along the Erie Canal system for use by canal system work boats. Because we had an adapter to access those outlets, we enjoyed shore power when others did not. Boats fit with 50A Shore Power inlets will regularly encounter situations where 50A outlets are not available. For these situations, 30A-to-50A adapters can provide access to a AC power sufficient to meet short-term needs. Simply put, adapters create options, flexibility and alternatives to boaters. Among the options, adapters can provide enough power to avoid the need to run gensets at a dock. Note: this article applies to boats which are NOT fit with polarization/isolation transformers. In North America, the national standard for power delivered to residential and light commercial customers is a “single phase, three-pole, four-wire, center-neutral” wiring configuration. This system is sometimes referred to as a “240V grounded-neutral” system. In these systems, the service’s Neutral (white) conductor is bonded (electrically connected) to the system’s Ground conductor. The bonding point is located at the “derived source,” ashore. Boats connected to shore power systems should never have the neutral and ground bonded aboard the boat. Connections to outlets fed from single phase sources in the utility distribution system will receive service voltages of 120V/240V. Connections to outlets fed from the phase legs of three phase sources in the utility distribution system will receive service voltages of 120V/208V. Figure 2 shows the common dock power distribution components found on docks at marinas, yacht clubs, boatyards, condos and municipal walls throughout North America. The “derived source” is defined by code to be the point where the Neutral-to-Ground Bond and the dock’s main disconnect circuit breakers are located. Dock electrical system feeders must be designed to support a number of boats at the same time, which means the current-carrying conductors of the dock feeder need to be quite large. In the US, the National Electric Code, Article 555.12, specifies the ampacity calculations of dock feeders. Figure 3 shows a simplified example of the most common configuration of 50A shore power outlets found on docks. This example shows the 3-pole, 4-wire dock feeder with drops to six 208V/240V, 50A shore power receptacles. The source for the dock feeder can be either 120V/208V or 120V/240V. This wiring configuration is mandatory in order to support boats fit with 50A shore power services. 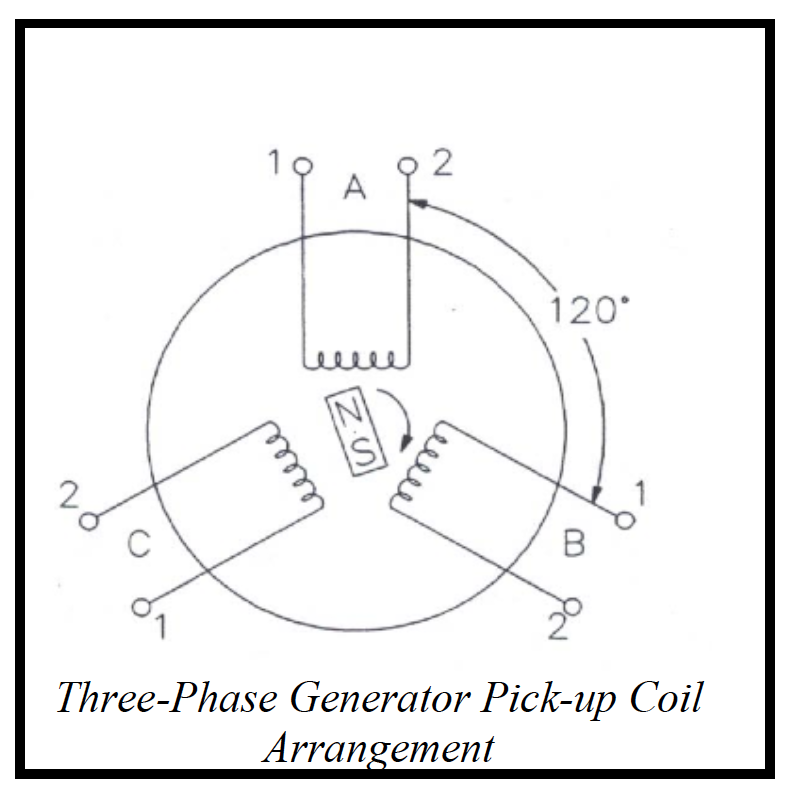 Note that the dock feeder is a direct electrical extension of the power transformer shown in Figure 1, and consists of the two energized conductors (L1 and L2), the Neutral conductor (N), and a safety ground conductor, (G). Figure 4 shows a portion of a 120V, 30A shore power configuration. In this example, each outlet provides 120V at up to 30A to the boat. Note that adjacent outlets in this wiring configuration are alternately connected to the two energized legs, L1 and L2. Since both energized legs are necessary for 208V/240V service, this would be the most common way to connect 30A outlets in the case of a dock with a large number of 50A outlets. Figures 5 and 6 show two alternative configurations for providing 30A shore power at a slip. As in Figure 4, each outlet in Figures 5 and 6 provides 120V at up to 30A to the boat. The difference in these examples is that all of the 30A outlets are connected to the same energized leg, rather than to alternate legs, of the dock feeder. For 30A boats, this configuration is functionally equivalent to the example in Figure 4. Boats requiring two 30A shore power services will never notice or be affected by the difference between the configurations shown in Figure 4, Figure 5 or Figure 6. For boats that require 208V/240V shore power services via a 50A, 4-Wire shore power cord, a “Smart Wye” splitter can provide shore power from the example shown in Figure 4, albeit at reduced total amperage capacity of 30A, total. However, the “Smart Wye” will not deliver any power at all if connected to the configurations shown in Figures 5 and 6. Figure 7 shows the electrical diagram of a “Smart” Reverse Wye Splitter. To the left are two 30A male plugs which are fit to 30A pedestal outlets. On the right is a 50A female, which receives the boat’s regular shore power cord. In the box at the center, a relay is used to forward power from the pedestal outlets (dock feeder) to the shore power cord. A 208V/240V relay, K1, is connected between the two energized conductors of the two incoming 120V, 30A lines. Figure 8 shows a “Smart” Reverse Wye connected to the dual-leg dock feeder wiring configuration (as previously shown in Figure 4). This wiring alternative places 208V/240V on the relay coil, K1. The relay “picks,” meaning the contacts of the relay close, and this allows 208V/240V shore power to feed through the splitter to the boat. With this adapter, 208V/240V appliances will work. Because the input source is limited to 30A, boat loads may need to be manually limited and controlled to avoid drawing more than 30A. However, with attention, most boat equipment can be used successfully, even if not at the same time. Figures 9 and 10 show the Smart Wye Reverse Splitter connected to the two alternative single-leg dock feeder configurations. In these cases, since both 30A inputs are connected to the same energized dock feeder leg, there is no voltage between them; that is, zero volts. Since the relay requires 208V/240V to operate, the relay in this case does not “pick,” and no power at all is allowed to pass to the boat. In cases where only one energized dock feeder leg is available, the only way to get any shore power at all to this 50A boat – however limited – is with another type of power adapter. Options are available. To understand the options, it is necessary to first understand how the branch circuits aboard the boat are wired. Figure 11 shows an incomplete but representative view of a 208V/240V boat electrical system. Although I have modified the diagram, credit for the base is to the American Boat and Yacht Council (ABYC), Annapolis, MD. This diagram shows a “typical” AC shore power configuration for a boat built with a 208V/240V, 50A AC power system, and found without a polarization/isolation transformer. The left side of Figure 11 shows the dock feeder discussed above. At the center-right of the drawing, the AC power buss shown in colors is the AC power buss of the wiring of the boat. All boat equipment gets power from the boat’s AC buss via branch circuit breakers. The 120V utility outlets on a 208V/240V boat can be attached to either one of the energized conductors; to L1 alone, or to L2 alone, or some to L1 and some to L2. The drawing shows two utility outlets. The top outlet is fed by L1 and the bottom outlet is fed by L2. Any adapter that’s used to supply some limited power onto a 208V/240V boat must provide that power to both L1 and L2. Figure 12 shows a 30A-to-50A adapter that will accomplish the goal. Power from one of the energized dock feeder legs is brought through the pigtail to feed both the L1 and L2 blades of the 50A receptacle. Each 50A receptacle blade will have 120V, but because they are fed from the same point, there will be no 208V/240V power. Commercial straight pigtail adapters like this are available. Power is limited to 30A, total. With this adapter, 208V/240V appliances will not work, but important 120V refrigeration, lighting, entertainment systems and computers connected to 120V utility outlets will be OK as long as the total load is managed to be less than 30A. This entry was posted in 50A Power from 30A Sources on 2016/09/23 by gilwellbear. Several boat owners have ask how they can find an electrical technician who is qualified to troubleshoot ground fault issues on their boats. The answer is, it can be quite tough. This post will describe the reasons service technicians see this work as bad business. To review, this overall problem is the result of “backwards incompatibility” between the “real world” as it exists today vs. the noble goals of the National Electric Code (NEC) code and standards writers. Starting in 2011, the NEC, Article 555.3, requires Equipment Protective Devices (EPDs) on marina docks and at boatyards. I use the term “ground fault sensor” for EPDs and several other similar devices. The 2017 edition extends the requirement for ground fault sensors to single-family residential docks. By requiring ground fault sensors on docks and at boatyards, the NEC standards writers have caught many dangerous problems on boats. The widespread rollout of ground fault sensor technology on docks is making boating more safe for all of us, and that will only continue as time proceeds into the future. Many boats in the pleasure craft category have had ground fault and leakage fault problems aboard for many, many years. Up to now, these faults have been silent, hidden and non-symptomatic and boat owners have typically been unaware of the presence of these problems unless they led to a fire or injury. Marina operators generally do not have marine-skilled electricians on staff, so boater complaints result in referrals out to the electrical contractor who performed the facility upgrade. The correct response to Mr. Boater: “Sir! You have one or more problems aboard your boat!” I’m sure we can all appreciate how well that message is received by some owners! Ultimately, lots of professional time is wasted, and no one is happy. Ground faults on boats are often directly caused by work that was previously done – incorrectly – by the boat’s owner! Always, ground faults on boats result from failing to know and comply with the ABYC electrical standards for boats. Marine electrical technicians with the skills to sort through ground fault and leakage fault symptoms and who can troubleshoot these problems are absolutely overwhelmed by their current workload, and this will only get worse in the future as more and more facilities upgrade their shore power systems. This spike in ground fault troubleshooting workload is entirely IN ADDITION TO the normal types of workload these technicians would otherwise be staffed up to handle. Demand for these skills far exceeds supply. Furthermore, troubleshooting ground fault/leakage fault problems is not work for beginners. Diagnosis of these problems involves advanced troubleshooting skills that take time and experience to develop. (Analogy: Oncologist vs. Family Practice physician). Complicating the problem is the fact that the vast majority of boat owners don’t know anything about electricity or electric circuits. Many boat owners are afraid of electricity in all forms. In fact, when a professional does encounter a knowledgeable layman, the technician may doubt that the layman actually knows what he’s talking about; most laymen don’t, and that is the technician’s life-experience. So, all this results in largely uninformed and unskilled customers asking for the most advanced and complex kinds of professional services. Troubleshooting ground faults on a boat is not good business for the marine electrical technician. When the technician is all finished with the very complex and tedious work he’s done, to the boat’s owner, everything is exactly the same as it always was. The boat owner is presented with a bill – maybe a big bill – for the complex, tedious and highly skilled work, and there is nothing except the intangible of a “safety improvement” that this owner receives in return. There are no shiny new LED fixtures, no neat new trash compactor, no nice new HDTV, no new decor lighting, no improvements in heating and cooling efficiency. Nothing new and glitzy! Just the same old, same old. To repeat myself, “Troubleshooting ground faults is not good business for the marine electrical technician.“ There are very few common themes in diagnosing ground/leakage faults on boats, so virtually every boat requires a customized approach to troubleshooting. Very few boaters have electrical diagrams of their boats, and what few diagrams that are available are often incomplete and do not contain the low-level detail of wiring for things like reverse polarity detectors or the active control module on a galvanic isolator. And certainly not for detachable items like user-supplied surge suppressors. Every technician knows that each of these service calls will probably take a lot of diagnostic and repair time. At the technician’s billable rate, that translates to a big bill for the boat owner. Big bills translate into unhappy boat owners. Unhappy boat owners translate, for the electrical technician or the business manager, into billing disputes, “no-pay” or “slow-pay” customers, and the legal falderal that goes with all that stuff. In short, everything about this work, from the technician’s point-of-view, amounts to “bad Karma.“ It should be no surprise, then, that many technicians are refusing this work. So, to the question: “how can an amateur with minimal knowledge look for [ground fault] problems?” In some locales, it’s going to be very difficult. I know of good electrical shops that discourage or refuse this work, either through outright refusal or premium pricing that discourages the boat owner. Boaters will have to keep looking until a technician is found who is BOTH skilled AND wiling to take the work. What I would recommend is to “ask around” both online and in the local market for references to technicians that other boaters respect and recommend. If the name of a person who’s particularly well respected comes up, and they accept the work, it might make sense to move the boat to their home area just to get that level of excellent service. (Analogy: findings a doctor or dentist or auto mechanic when you move to a new area.) Some boaters may be fortunate enough to have an established relationship with a qualified technician. If so, get on the work schedule as soon as possible and bite the bullet. To allow for getting on the technician’s work schedule and for the necessary onsite diagnostic time, boaters should assume and plan that this work will take a few weeks at dockside. Anticipate delays in day-to-day activity. The reality is, emergencies will happen and will have a higher priority for your technician. The ABYC website at http://abycinc.org/?page=CTD has lists of certified technicians by geographic area. Check to see if recommended technicians hold ABYC certifications. Some non-ABYC technicians may be able to do this work, too, of course, so in the same way you might ask a surgeon how many surgeries he’s done of the type you need, ask the technician about his/her experience troubleshooting ground faults. Finally, in general, for better or worse, avoid residential electricians; as a group, they won’t understand the marine environment. In fact, they do things in residential wiring that will CAUSE ground faults; things that SHOULD NEVER BE DONE ON BOATS. This entry was posted in Ground Faults: Difficult To Hire Troubleshooter on 2015/12/14 by gilwellbear. Major addition: “Test Tools,” incorporated 12/13/2015. Major addition: “Isolation Transformers,” incorporated 1/18/2016. In the United States, the 2011 revision of the National Electric Code required Ground Fault Sensing equipment at marinas, boatyards, condo docks, municipal docks and other marine facilities shared by multiple-users. The 2017 NEC added the Ground Fault Sensor requirement to private, single-family, residential docks. The rollout of 30mA Equipment Protective ground fault sensors (EPDs) at marinas and boatyards is having a big impact on many boats and boat owners. In some places, even more sensitive Ground Fault Protection devices (GFP) have been installed. The more sensitive the ground fault sensor, the more likely the conditions discussed below are to cause both real and nuisance power interruption problems for cruising boat. Man-made wiring errors (circuits mis-wired by unqualified personnel) are fairly easy to isolate and identify because they are constantly present and detectable until they are corrected. Some ground faults are “transient” and can appear to “come and go.” Transient ground faults can be difficult, time-consuming and expensive to isolate. Based on recent experience on several boats, I am more confident than ever that a substantial percentage (20%-50%) of the [pleasure craft] fleet does have man-made wiring errors aboard. In the past, the majority of man-made wiring errors have been hidden, silent and non-symptomatic aboard boats. These same errors will cause ground fault sensing circuit protection devices on docks and at boatyards to trip AC power “off.” Some of these problems originate with non-complying OEM component design and device selection, so even newly purchased, “straight-from-the-factory” boats are not necessarily free from the possibility of denial of power. Boats manufactured “offshore” are often not designed to be compatible with North American electrical standards. This article will highlight some ground fault causes that might require service attention from a boat owner. These conditions will NOT affect all boats. Transient conditions will NOT necessarily affect boats that also have man-made wiring errors. But for those that are affected, awareness of these possibilities will help with problem isolation and correction. Certainly, transient conditions – if present – will complicate troubleshooting of man-made wiring issues on boats. The Fort Pierce, Florida, City Marina completed a multi-million dollar major expansion project in 2016. The new floating docks at FPCM are equipped with Square D 125V/250V, 30mA Equipment Protective Device (EPD) ground fault sensing circuit breakers located at the slip-side pedestal. Sanctuary is fit with two 125V, 30A shore power circuits. When we arrived at FPCM, the dock attendant who landed us suggested we have all AC branch circuits on both panels (“house” panel and “heat pump” panel) set to “off.” That advice is the right advice for all boats in all cases. It is particularly useful for connecting the first few times to docks with ground fault sensors on their pedestals. After attaching to the pedestal, set individual branch circuits “on” one-at-a-time. If the pedestal breaker should trip while powering up, take note of which branch circuit breaker caused the trip. It will become obvious in reading this article why that information is very important to know and valuable to have. One major governing concept for all AC distribution systems in North America is that the neutral conductor of the system must be bonded to the safety ground AT THE SOURCE POINT of the AC power. For shore power (AC power source ashore), the neutral and ground are bonded together in the shore power infrastructure. An ABYC corollary is, for boats operating on shore power, the neutral and the safety ground MUST NOT be connected together aboard the boat. However, for inverters operating in “invert” mode (AC power source onboard), the neutral and safety ground MUST be connected together at the inverter, aboard the boat. In one case, the bond can’t be on the boat. In the other, the bond must be on the boat. Contradiction? No, it’s entirely consistent. In all cases, the neutral-to-ground bond is at the AC power source. An onboard inverter integrated into the boat’s electrical system must comply with the neutral-to-ground bonding requirements in the manner described by ABYC, E-11. To accomplish that, modern inverter devices have a relay inside the device. When operating in “invert” mode, the relay joins the boat’s onboard neutral (white) and ground (green) electrically together to create the required bonding connection. The relay disconnects the onboard bonding connection when the device has shore power and is operating in “passthru” mode. The operation of the relay maintains compliance with North American electrical standards. Some inverter devices may not have automatic transfer relays, and instead accomplish the transfer back and forth from shore power “passthru” operation to “invert” operation with manual switching. That is OK, as long as the transfer switching is wired correctly. The operation of the inverter’s internal transfer relay has implications that boat owners should understand. Inverters (or inverter/chargers) that are fully integrated into the boat’s electrical system will cause a short duration transient ground fault when shore power is first applied to the boat. At the exact moment – the very instant – the boat is connected to shore power, an inverter operating in “invert” mode will have the boat’s onboard neutral and safety ground connected together through the bonding relay. As viewed from the pedestal ground fault sensor, that condition is a true ground fault. In normal operation, when the inverter “sees” shore power, it transfers out of “invert” mode into “passthru” mode. The internal ground transfer relay removes the neutral-to-ground bond, and thus clears the ground fault. The ground fault sensor at the pedestal will not trip unless the ground fault exceeds 30mA and persists longer than the trip-time of the pedestal ground fault sensor. So for boaters and service technicians, the specification and operation of an inverter’s transfer interval is important. That relay transfer-time should be in a range less than 25mS. If the transfer relay is slow (due to equipment specification or environmental contamination), or if manual switching for the inverter is required, the transient ground fault may/will persist long enough to trip the pedestal ground fault sensor. The input side of an isolation transformer (primary winding) connects to the shore power pedestal. The output of the transformer (secondary winding) supplies the AC loads on the boat. 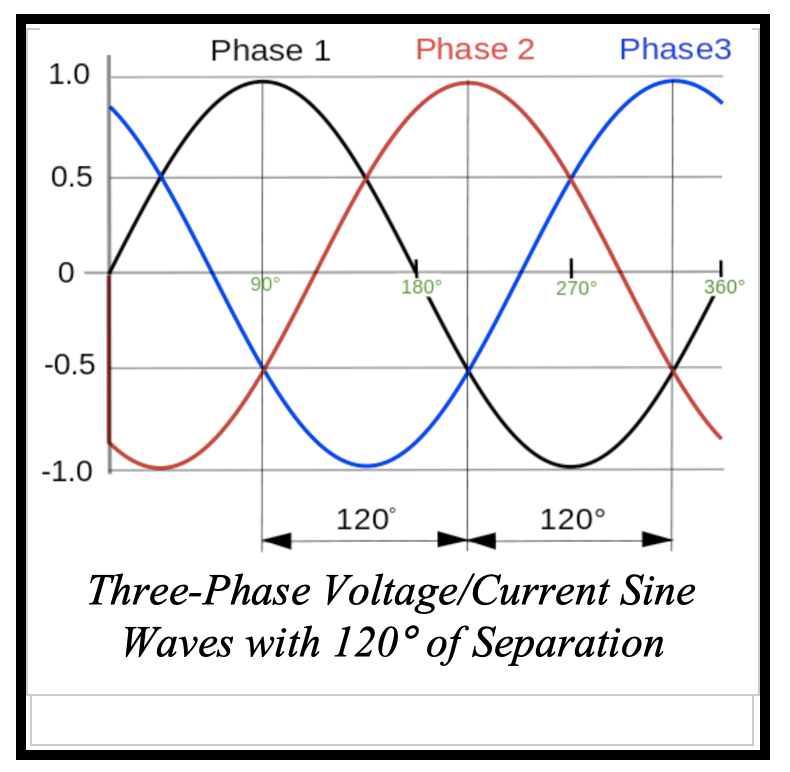 The “connection” between the primary and secondary windings of the transformer is via an alternating magnetic field that rises and falls with the rise and fall of the shore power primary voltage waveform. There is no continuous electrical connection between the shore power ground and the boat’s ground system. Like an onboard inverter or a onboard generator, an isolation transformer is treated by electrical codes as an onboard AC source, and so the neutral and ground of the transformer output (secondary winding) are bonded together on the boat. When a boat with an isolation transformer arrives at a dock after an outing, there is no alternating magnetic field present in the transformer. At the instant that shore power is applied to the transformer, there is a very high instantaneous “inrush,” or power-on surge, of current. The inrush current can be 10 to 15 times higher than the rated working current of the transformer. For large transformers with low winding resistance and high inductance, inrush currents can last for several seconds until nominal operating equilibrium is reached. All magnetically coupled devices (transformers, motors, generators) experience small, naturally occurring internal leakage currents. These leakage currents are proportional to current flow, and exhibit inrush-related transient spikes. One docks, pedestal circuit breakers with ground fault sensors provide two functions. First, they protect against electrical overload. 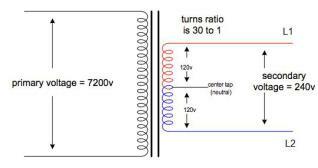 The nominal overload set-point is 30A for 125V circuits and 50A for 240V circuits. Second, they protect against leakage currents. The nominal leakage current set point is 30mA. 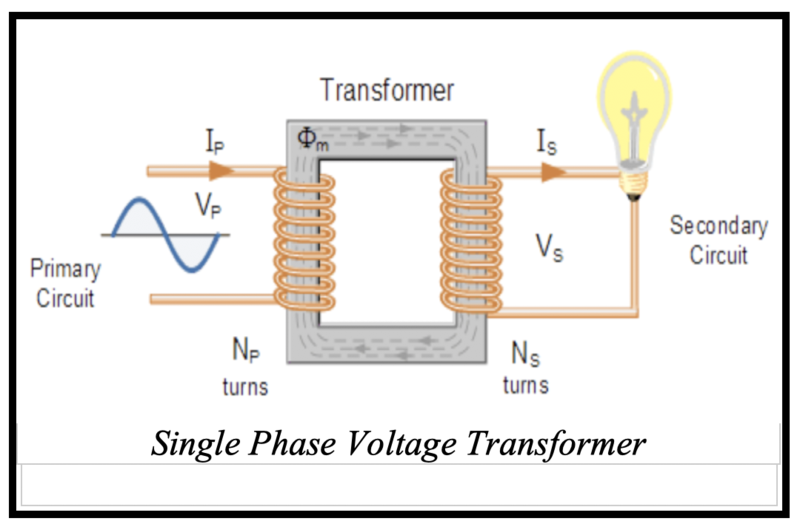 The moment that power is applied to a transformer, there is a huge inrush current that creates the magnetic field within the transformer. The inrush current looks like a spike to the electrical system. That spiking electric current must stabilize within the design limits of the circuit breaker before the breaker decides to trip “off.” Think of this as a “race” between the inrush phenomena and the design settings of the circuit breaker. The question becomes, does the inrush transient of the transformer fall to a level that is within both the overload and leakage current trip criteria of the breaker in a sufficiently short time to avoid having the breaker trip power “off?” Emerging evidence seems to suggest that there are some instances where the circuit breaker trips “off.”. A friend has a boat with a 50A, 240V shore power input to a Charles Industries IsoBoost Isolation Transformer. The IsoBoost never trips the 50A over-current set-point of conventional pedestal breakers. Not anywhere; not ever. So, the overload spike transient does fall within breaker tolerances sufficiently quickly. However, even with all onboard load circuit breakers set to “off,” that transformer routinely trips pedestal breakers containing 30mA, 100mS ground fault sensors. On that boat, the Charles IsoBoost inrush spike does not resolve itself within the trip interval of the ground fault sensor, so successful connection to shore power is not possible. The overload tolerance of the breaker is longer than the ground fault trip tolerance. Charles Industries has developed a “SoftStart” module that clamps and limits the magnitude of the inrush current. That “SoftStart” module is the solution that Charles recommends for tripping ground fault sensing breakers. It is highly likely that isolation transformers from other manufacturers may also be affected by this inrush spike phenomena. The “ground fault” in this scenario may result from capacitive coupling between the transformer windings and/or ground, or of inductive coupling through the electrostatic shield to ground, or a mix of factors. Whatever, it really doesn’t matter to an affected boat owner. It is something that can be mitigated by design improvements in the future, but those with affected transformers today will have to find work-arounds such as the Charles “SlowStart” module. Galvanic Isolators are devices that are installed aboard the boat. They are electrically located in series with the boat’s safety ground (green wire). Galvanic Isolators contain a diode pack (full-wave bridge rectifier) that blocks small DC galvanic currents but allows AC fault currents to flow. 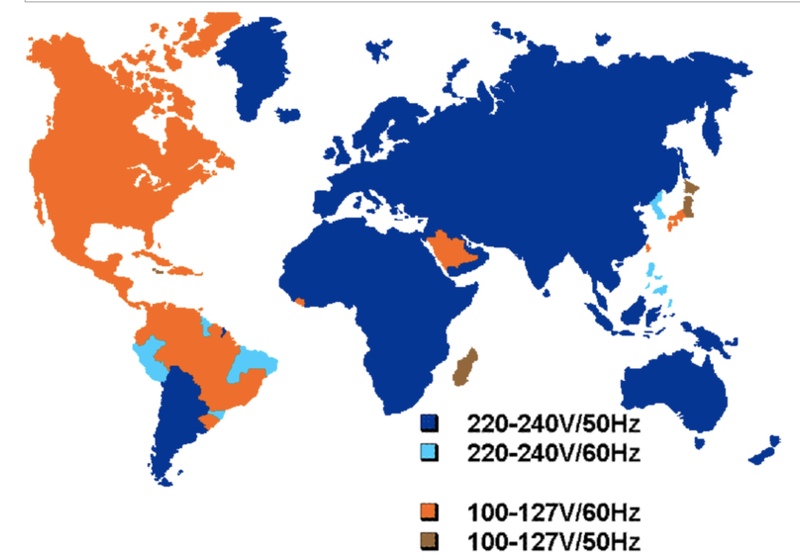 There are three “generations” of Galvanic Isolator technology. The first generation device consisted of a passive diode pack. That passive diode pack was subject to damage by an overload or surge, and that damage could leave the boat’s safety ground conductor electrically non-conductive to AC fault currents. Many of these 1st generation GI devices are still in service. Unknown to their owners, some percentage of those 1st generation devices are inoperative. That is a potentially serious safety risk. In response to an ABYC standards revision, GI equipment manufacturers developed a “second generation” device. The 2nd generation device utilized an electronic control module to periodically “test and verify” the electrical integrity of the diode pack. This 2nd generation equipment created a transient ground fault, and is incompatible with the emerging presence of shore power ground fault sensing equipment on marina docks. The newest third generation GIs are of the “failsafe” design. They have both a diode pack and a large capacitor, and no longer have electronically active test modules. Third generation devices are designed so that they will not fail in an electrically non-conductive state. If they fail, they fail in an electrically conductive state. In that state, the boat may lose DC galvanic protection, but WILL NOT lose AC safety ground continuity. Many boats are still fit with second generation Galvanic Isolators manufactured between approximately 2002 through approximately 2008. One such unit is the Professional Mariner (ProMariner) Prosafe 1, which is the device I installed on Sanctuary. At the time these devices were developed, impressing a small ground fault current on the ground conductor was not a concern in marine shore shore power systems, because marine shore power services did not have ground fault sensors. Thus, using an intentional ground fault was a viable approach. The Prosafe 1 tests the ship’s ground connection when the device is first connected to shore power, and periodically thereafter in regular operation. The Prosafe 1 monitor detects the presence of the impressed ground fault, thereby confirming the integrity of the boat’s ground connection through the Galvanic Isolator diode pack and into the shore power infrastructure. The Prosafe 1 ground fault current is specified at 30mA, and it can last a variable period up to several seconds. The net is, that ground fault can cause a shore power pedestal’s ground fault sensor to trip. In my personal experience aboard Sanctuary, the symptoms have been variable. At Chesapeake City, MD, I was able to connect to the two 30A receptacles but not to the 50A receptacle through my splitter. At Ft. Pierce, FL, I was not able to connect to a 30A receptacle, but was able to connect to a 50A receptacle through a splitter. HOWEVER, at both Chesapeake City and Ft. Pierce, Sanctuary would trip the pedestal breaker at random time intervals. Sometimes the monitor’s “test pulse” would not cause a trip, and sometimes it would. During the overnight period, Sanctuary tripped the shore power breaker, on average, twice. But I was, for some reason I can’t explain, able to reset the breakers. ProMariner Technical Support has confirmed the above description. ProMariner acknowledges the problem. The Prosafe 1 GI device is now discontinued and obsolete, so the company’s advice is, “upgrade the Galvanic Isolator to a ‘failsafe’ design.” It’s unfortunate that the investment in the 2nd generation device is lost, but ProMariner’s advice is the right technical advice. The important thing is to be aware that this problem exists. This issue can cause unexpected results and RANDOM loss of power on an otherwise properly wired boat at docks equipped with ground fault sensing circuit breakers. The heating element of a hot water heater, by design, lives in a pool of stored water. That water provides a path for an electric current to flow from the heater element, through the water, to ground (via the plumbing connections) to the frame of the device. As water heater elements age, and through many years of heating/cooling cycles, micro-cracks develop in the ceramic insulation of the heating element. Electrical contact between the live conductor of the heating element and the water in the heater’s tank will cause transient ground faults as the water heater cycles “on” and “off.” The physical size of the contact area, the voltage present at the point of contact and the conductivity of the tank’s water (mineral content) will affect the magnitude of ground fault currents. This can be an elusive problem to isolate. If the water is also heated by a propulsion engine hot water heat exchanger, the water in the hot water tank will be hot enough at the end of a day’s outing that the water heater will not cycle when the boat is first connected to shore power. In that case, the ground fault will appear at some miscellaneous and random later time; maybe the middle of the night, maybe the next day, maybe at shower time. Random equipment aging problems are common in battery charging equipment, household appliances like refrigerators, freezers and ice makers, and other motor-driven appliances like washer/dryers. If a shore power ground fault sensor trips at random intervals, try cycling one piece of equipment “on” and “off” at a time to isolate the cause. Boats fit with 125V, 30A marine shore power services require a Reverse Polarity indicator. A Reverse Polarity device detects, and warns the boat owner of, reversal of the incoming hot (black) and neutral (white) shore power conductors. This is a very rare but very dangerous condition. AC power distribution panels and several aftermarket devices are built with reverse polarity detectors, so some boats may actually have several such RP detectors aboard. Electrically, they are all connected in parallel. Both of Sanctuary’s factory-installed power distribution panels have them, our aftermarket Galvanic Isolator (Prosafe 1) has them, and our aftermarket Bluesea Systems Generator Transfer Switch has them. The ABYC E-11 Standard calls for these devices to present at least 25KΩ of electrical impedance, but of course, several of these devices in parallel can result in much lower net impedance. Since by definition, these devices are a “ground fault,” their net effective resistance, if too low, can cause random trips of ground fault sensors on docks. And, especially so in combination with other conditions. Dockside cable wiring for TV and Internet services, and wiring for Internet service via DSL telephone lines, can cause transient ground faults on connected boats. Normally, cable services and telephone services at marinas are grounded at their point-of-entry to the marina property. HOWEVER, that point IS VIRTUALLY NEVER the same physical point where the shore power ground bond is established. That difference in connection point leads to a phenomena called “ground loops” between and among the dockside services. 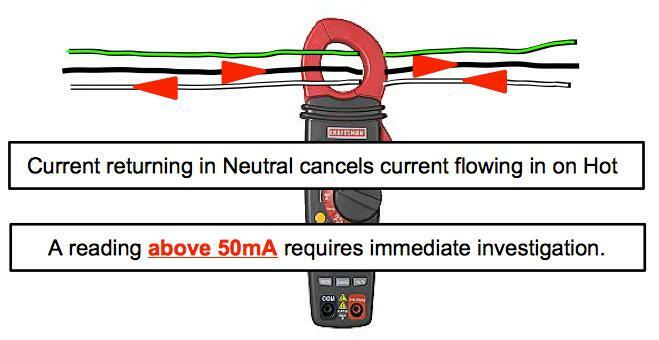 Ground loop currents can cause transient or continuous ground faults. These ground faults are prone to appear when AC electric demands are highest (hot summer days, cold winter days) on docks. Also, TV and telephone cables are less resistant to corrosion and environmental conditions than the heavy conductors of the AC shore power system. Boaters who use cable TV and/or wired Internet services and experience random trips of ground fault sensors should try disconnecting these services for problem diagnosis and isolation. The long term fix will most likely require the marina to get the various system grounds tied together at the bonding point of the AC power system ashore, but disconnecting those small signal wires from the boat will interrupt the ground fault path and may temporarily alleviate random nuisance tripping of pedestal shore power ground fault sensors. With the advent of the computer age, surge suppressors have become ubiquitous in homes and on boats. There are whole-house surge suppressors that attach to the building’s incoming power line, and there are supplementary surge suppressors in many forms that attach to residential 125VAC power outlets. Computers, TVs, home routers and any number of electronic toys can be protected from transient spikes on power lines by these devices. The way surge suppressors work is by dumping surge energy “spikes” to ground. There are special diodes in the surge suppressor that bridge the hot current carrying conductor to ground. Recall here that the neutral current carrying conductor is already grounded in the shore power infrastructure. When a high-energy “spike” occurs, the diode is intended to conduct that transient energy to ground. Imagine that a boat is in the vicinity of a “near-miss” lightening strike. That lightening strike causes a large but short-lived energy spike on the electric power line. The onboard surge suppressor acts to ground that spike, thus “saving” attached computer and entertainment equipment from damage. This now becomes the same discussion about damaged diodes that applied to the diode pack of a galvanic isolator. The diodes in the surge suppressor can be damaged in a way that leaves them partially-conductive. That is a true ground fault. In this scenario, the ground fault sensor at the dock pedestal will trip when the circuit breaker with the defective surge suppressor is powered “on.” If a utility outlet circuit causes a dockside pedestal ground fault sensor to trip, consider the possibility of a defective surge suppressor. Every boat with an onboard generator integrated into its electrical system in a manner prescribed by ABYC E-11 will have a selector switch (Generator Transfer Switch) to transfer the boat’s distribution panel(s) between shore power or generator power. That switch MUST transfer BOTH the hot wires (red, black) AND the neutral wire (white). The reason for the need to switch the neutral conductor lies with the grounding requirements for AC circuits, described above. The neutral is bonded to the safety ground AT ITS SOURCE. For shore power (source ashore), the neutral and ground are bonded in the shore power infrastructure ashore, and MUST NOT be connected together on the boat. For generators, the neutral and safety ground MUST be connected together at the frame of the generator (source onboard). To comply with the AC bonding requirement, the neutral, as well as the hot wires, must be switched by the Generator Transfer Switch. Some boat manufacturers have used switches that do not transfer the neutral. Some aftermarket installers, to save cost, have used switches that do not transfer the neutral. In the past, that was a hidden, silent, non-symptomatic wiring error. Now, the permanent leakage fault that it creates will trip pedestal ground fault sensors. The shared circulator pump is activated when any of the individual heat pumps call for heat or cooling. The pump itself is energized via a controller [black box] that contains either mechanical relays or electronic switching. The design of the controller must be handled in a way that does not interconnect (bridge, commingle) the two shore power neutral circuits on the boat. If the neutrals are bridged together aboard, that will cause a leakage fault that will trip shore power ground fault sensors. Some household appliance manufacturers, and some residential electricians, connect the neutral wire of the appliance to the green safety ground wire at the appliance. That practice has it’s roots in older (1940s and 1950s) residential systems where there was no safety ground in the residential wiring. I system without a safety ground, attaching the neutral to the appliance frame at the appliance provided some protection from some kinds of faults. Today, that condition is called a “phantom ground.” In modern residential systems, it is an NEC code violation, and on a boat, it is a clear violation of ABYC E-11, in both cases because it results in a man-made ground fault. If the affected appliance is permanently wired into the boat’s electrical system, this condition will always and continually trip a pedestal ground fault sensor. It does not matter if the appliance is powered on, nor does it matter if the circuit breaker feeding the device is set to “on.” If the appliance is pluggable, physically removing the plug from the receptacle will clear the fault. After I put this article up as a post on my website, several readers asked if I could recommend tools that can test for ground faults and leakage faults. I would only suggest a DIY approach to ground and leakage fault diagnosis to people who self-describe their personal electrical skills as “high” or “advanced.” This work requires the technician to have contact with energized AC electrical circuits containing dangerous, life-threatening voltages. ONLY THOSE WHO – BY TRAINING AND EXPERIENCE – CAN SAFELY PERFORM WORK ON AND AROUND ENERGIZED AC CIRCUITS SHOULD ATTEMPT TO DO SO. PERIOD. Indeed, there are some test tools that allow technicians (and appropriately skilled boat owners) to detect the presence of faults on their boats. However, identifying the presence of faults aboard a boat is only the first step, and actually one of the easiest steps, in overall remediation. The follow-on activities of 1) diagnosing cause conditions, 2) sorting out multiple simultaneous causation conditions, and 3) applying corrective actions require a thorough knowledge of boat AC electrical systems. Many corrective actions for ground and leakage faults can lead to re-wiring AC circuits; in some cases, re-designing AND re-wiring of systems may be required. And as I’ve said before, diagnosing ground faults and leakage faults is a “high” to “advanced” skill. For those who are confident in their skills and ability to work safely, my first suggestion is to look at the “AC Safety Test” article on this site, located here: https://gilwellbear.wordpress.com/category/boat-technical-topics/electrical-topics/boat-ac-topics/ac-safety-tests-for-boats/. These tests will expose the presence of wiring conditions that result in faults due to wiring errors made by unqualified personnel. If performed as I have described them, they require minimal to no exposure to energized electrical circuits. 1. There is a local group of businesses in Georgia (Marine Surveyors of North Georgia) that is making and selling a device they call a “Stray Current Sensor” (SCS). It is a versatile test tool that can be used to track down ground faults. The tool can accommodate EITHER 50A boats or boats with two 30A inlets. It sounds an alarm, but DOES NOT trip off the electric service to the boat, when a ground fault is detected. I like that as a test tool approach, because as a technician, I can keep working without having to reset the whole boat each and every time a fault is detected. The tool is built upon one of the ABYC-compliant Equipment Leakage Circuit Interrupter (ELCI) current transformers (North Shore Safety Systems, PGFM Control Module, which by the way is also a solution I really like). Here’s a link to the device: http://www.marinesurveypros.com/scs-stray-current-sensor/. As I read the MSNG website, it looks like boat owners could rent one of these tools to use for diagnosis and troubleshooting. That would be a great solution for boaters possessing appropriate electrical skills. The tool is really only needed on a one-time-use basis. Once the boat is “cleaned up,” the tool isn’t needed any longer. So, if the rental charge is reasonable, I’d seriously consider this option. 2. 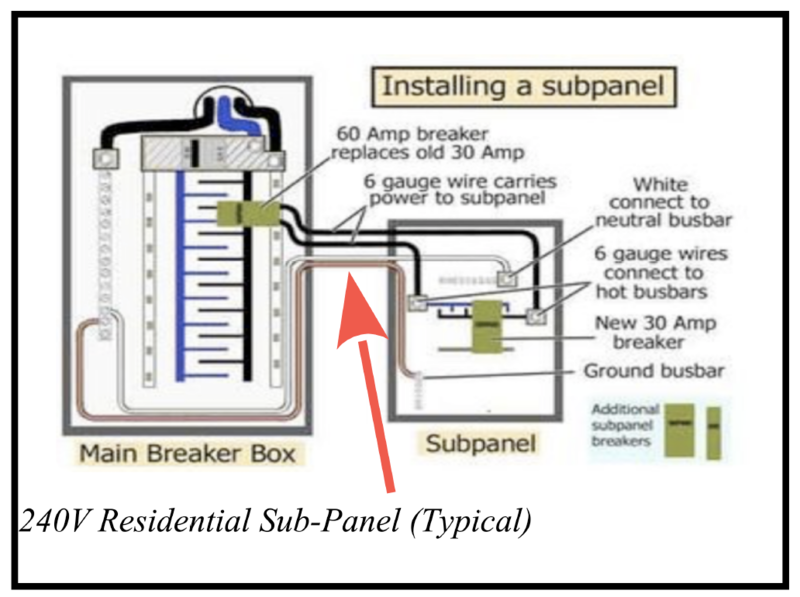 Home Depot offers an electric panel that’s intended to provide electric service to home Spa pools: http://www.homedepot.com/p/Eaton-50-Amp-BR-Type-Spa-Panel-BR50SPA/100206043?keyword=spa+circuit+breaker. It would be ideal for a test tool for a 50A boat. It would be possible to wire this box as a tester for two 30A boat circuits, but that would require changing the double pole 50A GFCI breaker to two 125V GFCI breakers. In either configuration, it would be necessary to add the necessary wiring and connectors, as this is just the raw box. Hubbell and Marinco marine-rated 50A plugs and receptacles cost about $80 – $100 each. NEMA SS-2 50A male plugs and female receptacle fittings are also available at Home Depot that would be suitable for an OCCASIONAL USE, FAIR-WEATHER-ONLY USE, test tool, for a lot less than that. 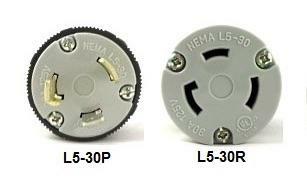 Likewise, NEMA L5-30 male plugs and female receptacles are also available at Home Depot. The breaker that comes installed in this box is a GFCI Personal Protective breaker with trip sensitivity of 5mA. The ground fault sensors on docks are Equipment Protective Devices (EPD) with a 30mA trip setting. The implication is, if you have BOTH 1) one or more significant ground faults AND ALSO 2) one or more of the transient types of ground faults, the sensitivity of this breaker could complicate using it as a diagnostic tool. “Clean” boats will probably operate OK on 5mA breakers; there is some (as yet unpublished) experience that leads to that conclusion. However, a completely safe boat may also have nuisance trips with 5mA GFCI breakers. Man-made wiring errors can be hidden, silent and non-symptomatic. While they may remain non-symptomatic for many years, they should not be regarded as fundamentally safe. Electrical codes are intended to protect us when ABNORMAL things happen in electric circuits; when connections get corroded, when insulation fails or is abraded to expose the metal conductor, when wires get disconnected, when short circuits occur. Bridged (commingled) neutrals work when everything is in perfect order with good connections, but if one of those conductors fails, the other can be severely overloaded and becomes a fire risk. AN open ground conductor means protection from electric shock is absent or compromised. Corrective action should be taken with any boat found to have wiring issues. It’s just the safe thing to do! Reference: An excellent reference article on GFCI, ELCI and GFPE technologies can be found here: http://www.ecmag.com/section/codes-standards/differences-between-gfci-idci-and-gfpe. This entry was posted in Ground Faults and Ground Fault Sensors on 2015/12/11 by gilwellbear. Note; Major revisions to this post, with additional test added, June 20, 2015. This article describes a series of test measurements intended to be performed safely by boat owners/operators. Little or no prior knowledge or skills with electricity, electric circuits or the regulatory codes, components, materials, workmanship and techniques involved in installing and servicing AC electrical systems is needed. There is never a need to contact a “live” electrical circuit. The tests assess the safety status of a boat’s AC electrical system. These tests can a) expose non-compliance and/or b) confirm compliance with a key subset of safety elements of the ABYC E11 electrical standard. Compliance of the boat to ABYC electrical standards is becoming more and more important. As shore-side facilities upgrade to the requirements of newer versions of the National Electric Code (NEC), boats that do not comply risk being left without AC electric power. For background information on that concern, see my article, “Emerging AC Electrical Concern,” on this website. Shore power cords labeled “2-wire plus ground” contain three conductors. The conductors are individually coated with green (ground), white (neutral) and black (hot) insulation. Shore power cords labeled “3-wire plus ground” contain four conductors. The conductors are individually coated with green (ground), white (neutral), black (hot1) and red (hot2) insulation. The testing described in this document is presently limited to AC shore power pedestals and boat shore power circuits equipped with either 1 or 2, “2-wire plus ground,” 120V shore power circuits. These descriptions do not apply to boats with “3-wire plus ground,” 240V shore power systems. The purpose of these tests is merely to IDENTIFY and EXPOSE the presence of conditions that represent immediate or potential ELECTRICAL SAFETY RISKS or create incompatibility with shore power facilities such that shore power may be interrupted to the affected boat. Boat owners may wish to engage a ABYC-certified marine electrical technician for help in performing or interpreting these tests. The fault conditions that these tests can expose have an extensive array of possible causes. It is not possible to present a practical DIY list of effective corrective action(s). If fault conditions are identified in testing, it is necessary for electrical novice boat owners to engage an ABYC-certified electrical service technician to perform further diagnosis and corrective actions. PERSONS WITHOUT TRAINING IN INSTALLING AND SERVICING MARINE ELECTRICAL SYSTEMS ARE EXPLICITLY DISCOURAGED FROM ATTEMPTING DIY CORRECTIVE ACTIONS. CORRECTIVE ACTIONS MUST BE PERFORMED BY PERSONNEL WITH TRAINING AND SKILLS IN MARINE ELECTRICAL SAFETY STANDARDS! Any boat equipped with two 120V shore power inlets should have these tests performed on both of the incoming shore power circuits. NOTE: Tests 1 – 3 are performed on an energized dock pedestal receptacle. ONLY PERFORM THESE TESTS IF YOU KNOW BASIC ELECTRIC SAFETY AND ARE PERSONALLY COMFORTABLE PROBING A LIVE ELECTRIC CIRCUIT WITH VOLTMETER TEST LEADS. Ground and leakage fault currents that originate on a boat may cycle “on” and “off” with the automatic operation of equipment installed on a boat. Boat owners should have as much of the electrical equipment on the boat in actual operation at the time of testing as possible, including water heater, battery charger(s), range/oven(s), heat pumps, washing machine/dryer, microwave, refrigerator, ice maker, space lighting, entertainment systems, etc. Equipment that may harbor an electrical fault may not show symptoms unless it is actually running. If all devices aboard can not be run at the same time, testing may be performed in stages to ensure all onboard electrical equipment is tested. This testing does not include DC System tests. This testing does not cover DC galvanic currents or the testing or operation of Galvanic Isolator diode packs. This testing does not include advanced tests, procedures or test equipment that certified service technicians may utilize. Clamp-on Ammeter test configuration for 120V, 30A as used in Test 9. Tests 9A and 9B: Suggested “home-made” test “tool;” this test tool allows access to the individual conductors contained within a shore power cord and at the same time protects against actual contact with live electrical conductors. NOTE: Tests 1 – 3, following, are performed with the dock pedestal receptacle energized (turned “on”). ONLY PERFORM THESE TESTS IF YOU ARE PERSONALLY COMFORTABLE PROBING A LIVE ELECTRIC CIRCUIT WITH INSULATED METER TEST LEADS. 2. Verify the pedestal’s 30A receptacle connections.The governing electrical standard is NFPA 70 (NEC, Article 555). 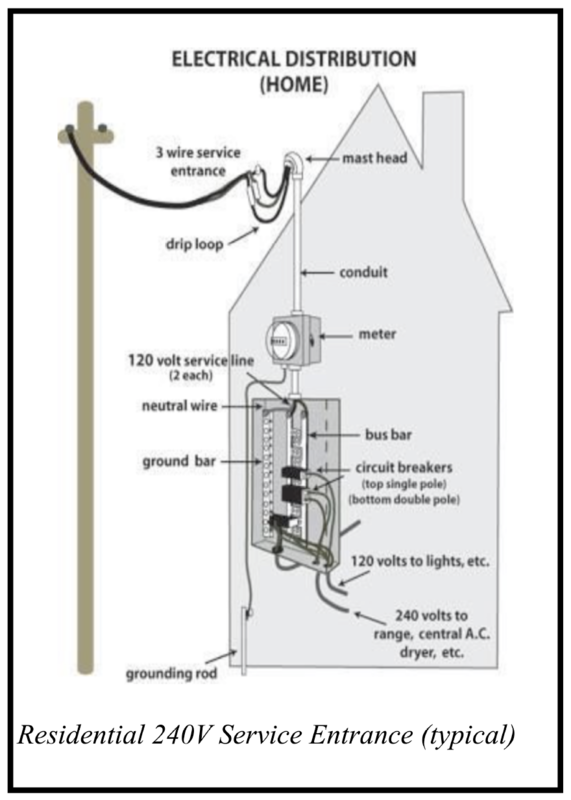 measure for AC voltage between the Ground and Neutral receptacle contacts. 2. Amount of power being drawn by boats connected to the feeder. 3. Reversed Polarity of Neutral and Hot conductors. 2. Verify the pedestal’s 30A receptacle connections. Governing standard is NFPA 70 (NEC, Article 555). measure for AC voltage between the Hot and Ground receptacle contacts. 4. Reversed Polarity of Neutral and Hot conductors. measure for AC voltage between Hot and Neutral receptacle contacts. Test Measurement Points Measure for resistance and continuity between the Ground blade of the cord’s male plug end (NEMA L5-30P) and the main AC Safety Ground Buss aboard the vessel. Fault Findings Requiring Correction Any varying or fixed value of greater than 1 Ω. Considerations Affecting Test Setup or Outcome Presence of Galvanic Isolator; consult manufacturer for procedures for testing the device’s diode pack. Presence of Isolation Transformer, which is considered an on-board, not shore power, source. The onboard ground does not connect to the shore power service ground. Purpose of Test 1. Confirm that the boat’s AC Safety Ground is bonded to the Ship’s common DC Ground. Governing standard is ABYC E11, 11.17.1.4.3. Test Measurement Points Measure for continuity between the Ground blade of the cord’s male plug end (NEMA L5-30P) and the Engine Block of the Propulsion Engine aboard the vessel. Considerations Affecting Test Setup or Outcome Presence of Galvanic Isolator; consult manufacturer for procedures for testing the device’s diode pack.Presence of Isolation Transformer, which is considered an on-board power source. The onboard ground does not connect to the shore power service ground. Purpose of Test 1. Confirm that cross-connections are not present between the ground buss and the neutral buss for the 120V circuit aboard the boat. Governing standard is ABYC E11, 11.5.5.1 and 11.17.1.2. 3. 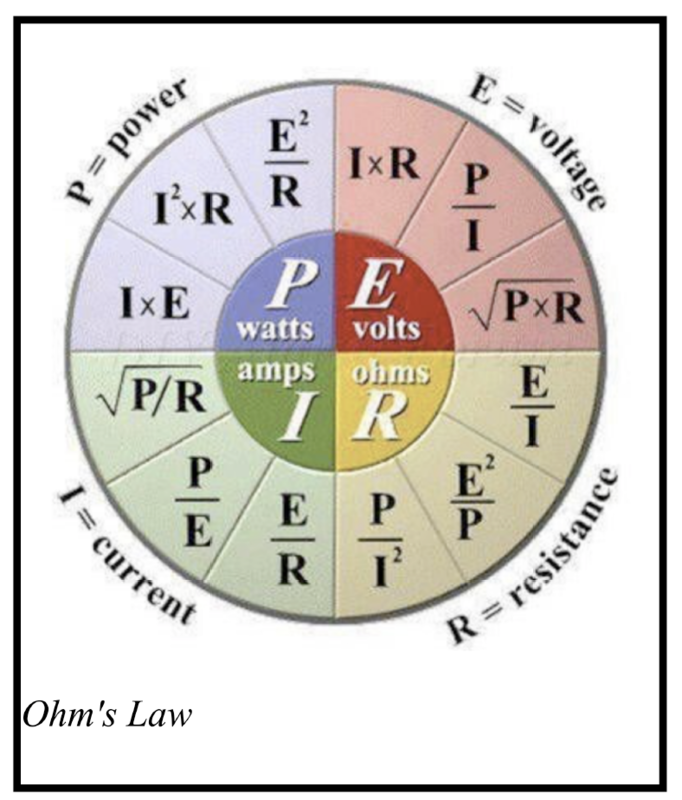 DMM set to measure Resistance (Ohms, Ω). Note: If the boat is fit with one or more inverter’s which comply with UL458, low resistance (<1.0 Ω) is a normal finding. It will be necessary to isolate the inverter’s automatic neutral-to-ground bond to complete the test. The process of isolating the inverter will be unique to the particular inverter manufacturer If unfamiliar with this process, consult a marine-certified electrical technician for assistance. Note 1: this test does not apply to (cannot be performed on) boats with only one AC Shore Power Cord. Note 2: this test correlates with Test 9C, which should also be performed if a non-infinity resistance value is found. Purpose of Test 1. Confirm that the AC Neutrals aboard a boat with two 120V AC shore power circuits are isolated from one another. Governing standard is ABYC E11, 11.5.5.6.2 and 11.17.1.3. Purpose of Test Confirm that the AC Grounds aboard a boat with two 120V AC shore power circuits are connected together and continuous with one another. Governing standard is ABYC E11, 11.17.1.4.2. Fault Findings Requiring Correction Any varying or fixed value of greater than 0 Ω. Purpose of Test 1. Determine if abnormal leakage currents are present in the shore power cords supplying power to a boat via two 120V shore power circuits. 1. This test is only an easy-to-perform screening test. 2. Any observed fault means that either a) power is being dumped into the water by this boat, b) power is returning to its on-shore source on an unintended conductor, or c) power which has already found its way into the water of the facility’s basin is finding it’s way back to its on-shore source via this boat’s ground system. 3. BECAUSE IT’S NOT POSSIBLE TO DETERMINE WHICH POSSIBLE CAUSE EXISTS WITH THIS SIMPLE TEST, ANY OBSERVED FAULT CONDITION NEEDS IMMEDIATE FURTHER INVESTIGATION. 3. All possible boat AC loads turned “on” and actually running/operating. 5. Clamp-on Ammeter set to measure AC Amps. Test Measurement Points Sequentially clamp the ammeter around the outer body of each 120V shore power cord. in fresh water, less than 25mA. If fault current is within above limits, skip to test 10. If fault current readings exceed the above limits, perform tests 9A and 9B. Also see notes titled, “IF TEST 9 IS POSITIVE,” following below. Fault Findings Requiring Correction Any varying or fixed value greater than 50mA (0.050 Amps) in salt water. Any varying or fixed value greater than 25mA (0.025 Amps) in fresh water. Note: There is imprecision and debate among experts around the absolute value of the above numbers. I feel these recommendations are a reasonable compromise between human/pet life-safety and the practical sensitivity of inexpensive, utility-grade clamp-on ammeters available OTC from community sources (marine chandleries, big box and hardware stores) at prices that lay buyers are willing to pay. Furthermore, periodic screening checks for ground fault and leakage fault currents is vastly better than never checking, which results in being unaware of the actual presence of a potentially serious problem. Any doubt about life safety should be immediately referred to a marine-certified electrical technician. Considerations Affecting Test Setup or Outcome As much of the electrical equipment installed on the boat as possible should be “on,” running and in operation at the time of the test. This includes water heater(s), battery charger(s), inverter/charger(s), heat pump(s), refrigerator, ice maker, watermaker, range/oven, washer/dryer, lights, entertainment devices, etc. If it is not possible to run all equipment at the same time, perform this test in multiple steps, each with different equipment running and in operation. The more equipment that is running at the time of the test, the more comprehensive the test results will be, and the greater the confidence about the results. Test 9A can be performed on boats with either one or two 120V, 30A shore power cords. On boats equipped with only ONE shore power cord, or when only ONE shore power cord is physically connected between the test boat and the shorepower pedestal at the time the test is performed, a non-zero test finding indicates that power is escaping from the boat into the surrounding water. On boats equipped with two 120V, 30A shore power cords when both shore power cords are physically connected between the boat and the shore power pedestal, a non-zero test finding is only an indication that abnormal currents are present, but the test does not distinguish between a Ground Fault and a Leakage Fault. A Ground Fault is a condition that results in power leaking into the water surrounding the boat. A Leakage Fault is a condition in which power returns to its on-shore source, but it returns on an unintended conductor of the AC system. 2. Leakage Faults, which are not a Ground Fault, but result in current following an unintended path back to its on-shore source. Test Setup 1. Install the recommended test tool jig fixture* between the pedestal outlet and the shore power service cord in order to gain access to the three individual shore power conductors (Black, White, Green). 4. All possible boat AC loads turned “on” and actually running/operating. 6. Clamp-on Ammeter set to measure AC Amps. * The test tool I suggest for this testing is a “home-made,” short 30A “extension cord” fit with an L5-30P male plug on one end and an L5-30R female receptacle on the other end. Carefully remove about 8” of outer jacket insulation to expose the individual electrical conductors (green, white and black) inside the cord. Only remove the outer exterior insulation jacket. Be careful not to cut or damage the green, white and black insulation covering the individual conductors. Test Measurement Points Install the clamp-on ammeter around BOTH the White and Black wires of the shore power cord at the same time, but excluding the green wire. Possible Findings A value ranging from 0.0 A to several amps Any non-zero amps (positive) finding means a fault current is present. If this test is positive with only ONE shore Power Cord physically connected between the boat and the shore power pedestal, it should be treated as an URGENT EMERGENCY. 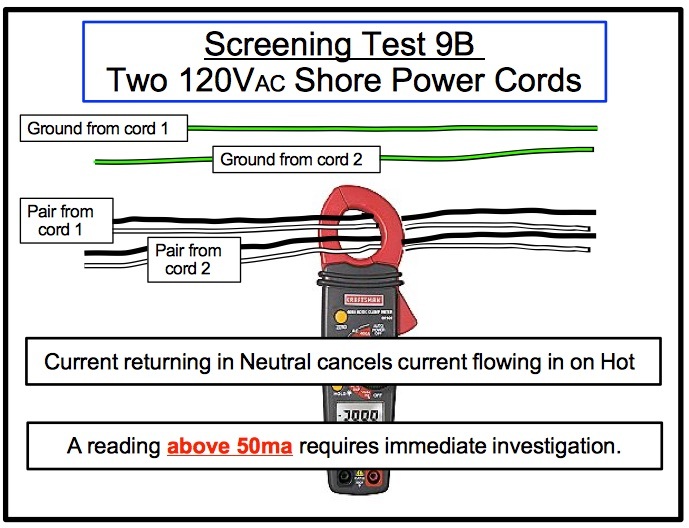 If this test is positive on a boat with two shore power cords connected between the boat and the shore power pedestal at the time of testing, continue to Test 9B. Fault Findings Requiring Correction Any varying or fixed value greater than 50mA. Considerations Affecting Test Setup or Outcome On-board equipment running at the time of the test. The more equipment that is actually in operation at the time of the test, the more comprehensive the test results will be. Test 9B is indicated any time a non-zero AC current reading is found in either one of the two 120V shore power cords in Test 9A. The purpose of this test is to differentiate between the presence of a Ground Fault or the presence of a Leakage Fault. In order for power to flow from a boat into the surrounding water, two faults must by present simultaneously. The first necessary fault is an open circuit or high resistance in the boat’s green safety ground connection to the shore power infrastructure (identified in Test 4). The second necessary fault is the presence of a condition that has unintentionally energized the safety ground circuit. This can be caused by a wiring error or equipment malfunction aboard the boat. If the safety ground connection from the boat to the shore power infrastructure is sound, and if incorrect neutral/ground wiring connections are present aboard, fault currents can exist in a hidden, non-symptomatic state. Fault currents which evolve to become symptomatic can be lethal to people and animals in nearby waters. Defective ground connections are easy to avoid and easy to correct. Ground faults can be very difficult to isolate and identify. Several causes of ground faults can come on over a long period of time. Multiple ground faults can exist at the same time in any electrical system, making isolation and correction extremely costly and time consuming. Identification of ground fault cause is beyond the scope of this article. Diagnosis and correction of ground faults requires advanced electrical skills and electrical diagnostic experience. If Test 9A confirms this condition aboard a boat, the professional services of a certified marine electrical technician should be engaged. Cross-connected neutrals create Leakage Faults. Leakage Faults result in AC current flowing in conductors where it is not, at that time, intended to flow (the other neutral). This condition it is not a Ground Fault and does not result in power flowing in the water surrounding the boat, but it will result in tripping a Ground Fault Protection (GFP) device. Cross-connected neutrals are also a fire risk. If one of the neutrals were to become compromised, the other would take over the load intended to be carried by the failed neutral conductor. With both 120V, 30A circuits highly loaded, the remaining neutral conductor would be significantly overloaded. For example, assume the house circuit is loaded at 18 amps and the heat pump circuit is loaded at 26 amps. In the normal case, with conductors rated at 30A, both circuits are operating within their safe ampacity. But with cross-connected neutrals, if one of the neutrals were compromised or open, the worst case is that the other neutral would carry all of the current of both circuits, or 18 + 26 = 44 Amps. Now, that neutral conductor is operating well above it’s safe ampacity, will overheat, and would cause a fire. 2. a Leakage Fault returning power to its source on an unintended conductor. Test Measurement Points Install the clamp-on ammeter around the White and Black wires of BOTH shore power cords at the same time, but excluding the green wires. In this setup, you will have clamped around BOTH black wires and both white wires; four wires in all. Possible Findings A value ranging from 0.0 A to several amps A non-zero finding in excess of 50mA means a ground fault defect on the boat is dumping AC power into the water. Significant leakage can be lethal to swimmers, divers and pets. This finding is an URGENT EMERGENCY. A zero amp finding means all power is returning to shore, and no power is being lost to the water. However, because the measurements in the INDIVIDUAL CORDS were not 0.0A, this finding means the neutrals for the two shore power circuits are cross-connected on the boat. Note: There is also an alternative way to get the result provided by test 9B. It is easier, but requires more interpretation on the part of the person doing the testing. It is very useful if the shore power cords have clean contact blades making good electrical contact. If blade surfaces or contacts are degraded, it can be less clear. In the hope that it may be useful for some, following is how to approach it. When the neutrals of two 30A shore power circuits are cross-connected on the boat, they create a parallel path back to the shore power source. To perform this alternative test, connect both of the shore power cords to the pedestal outlets, but turn power “on” for only one cord. I like to power the heat pumps, because the compressors and raw water circulator create a large and obvious load. For this example, let’s assume that the heat pump circuit draws 26 amps. Normally, that 26 amps should return to shore ONLY on the neutral conductor of the heat pump shore power cable, but if the two neutrals are paralleled on the boat, 1/2 the current will return on shore power cord A and 1/2 the current will return on shore power cord B. With power applied to, and load on, only one shore power cord, clamp each individual shore power cord, one after the other. If they make good electrical connections and show nearly identical ampere readings, that is a telltale that they are paralleled aboard the boat. That is, they are cross-connected together, in error, on the boat. In the above example, the total of 26 amps for the heat pumps would divide and return to shore on both neutral conductors. The meter would read 13 amps on EACH individual cord, but if both cords were clamped at the same time, the reading would be 0.0 amps. Yes, this condition will absolutely trip a GFP sensor on a dock pedestal. Purpose of Test 1. Definitively determine if power is entering the boat’s grounding system from the water in which the boat is floating (“hot” basin). Test Setup 1. Install a test tool jig fixture* between the pedestal outlet and the shore power service cord in order to gain access to the three individual shore power conductors (Black, White, Green). Test Measurement Points Clamp around ONLY the Green wire of the shore power cord, excluding both the Black and White wires. Possible Findings 0.0 A up to several amps Any positive finding means that AC power is flowing from the water of the facility’s basin back to shore through the boat’s ground system. This is a “hot basin,” which can be caused by a fault in the shoreside infrastructure or by AC power leaking into the water from a neighboring boat. Considerations Affecting Test Setup or Outcome Report this finding to facility management. Purpose of Test Verify the integrity and wiring of various on-board AC utility outlets. 2. All utility branch circuits set “on” at the boat’s AC breaker. 3. Test device is an AC Circuit Tester. 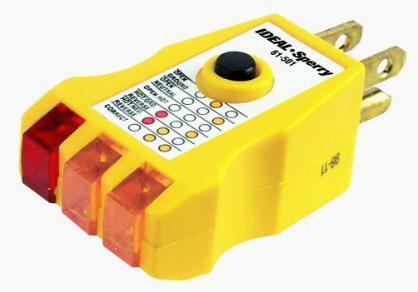 Test Measurement Points Insert the circuit tester into any energized outlet receptacle. Nominal Result Indicator lights show “Normal” condition. Possible Findings Indicator lights reveal abnormal condition. Fault Findings Requiring Correction Indicator lights reveal abnormal condition. Purpose of Test Verify correct operation of all GFCI-protected outlets.Governing ABYC Standard for minimum GFCI protection is E11, 11.13.3.5. Test Measurement Points With the AC circuit tester inserted into an energized outlet and displaying normal circuit condition, depress the “GFCI test” button. Possible Findings Circuit fails to de-energize. Fault Findings Requiring Correction Circuit fails to de-energize. Considerations Affecting Test Setup or Outcome Test does not apply to outlets not protected by GFCI device. If these tests have never been previously performed, a test cordset that allows access to the individual black, white and green conductors of the shore power cord is required for Tests 9A, 9B and 9C. If a test cordset is not available or cannot be borrowed, an electrical layman may want to call in a qualified service technician to continue diagnosis. Any non-zero result for Test 9A is an indication of an electrical fault on the boat. Electrical faults are dangerous, and can develop on any boat at any time. Electrical faults on a boat will require technical electrical skills to resolve. If the boat owner has been performing periodic screening tests of the shore power cords, and there is a history of normal Test 9 clamp tests (0 Amps), then there is a high confidence (not 100%, but high) that the boat is correctly wired. Additional testing is required to rule out the recent onset and development of a net-new fault condition. If staying at a facility as an overnight or short-term transient guest, one may opt to “just ignore” this single finding. One can’t be certain, but because there is a known history of normal tests on the boat, this case is probably caused by a hot basin at the facility. When the boat is subsequently relocated to another facility, re-test to confirm. The probability of encountering two hot basins in a row is very low, but not absolutely zero. If a positive test result follows the boat and recurs at a new location, the owner should then perform both tests 9A through 9C. If one encounters a positive test when clamping their own boat’s shore power cords, then clamping around the shore power cord(s) of the immediate dock neighbor (whether 30A or 50A; the normal reading in either case is less than 50mA) is advised. If non-zero readings are also present there, although one can’t be absolutely certain, in the case of a boat with a known fault-free history, it’s likely the facility basin is hot. If one observes fault readings on both the test boat and a neighboring boat(s), the owner should disconnect their shore power cords from the pedestal and re-check the dock neighbor’s cord(s). If the fault reading at the neighbor’s cord is gone, that suggests the test boat could be the source of the fault current. Unchanged non-zero readings at the neighbor’s cords suggests a hot basin. Reconnect the test boat and re-check. Unchanged non-zero readings at the neighbor’s cord(s) means the test boat is not the source of the fault current. If one has confidence that an on-site facility employee will understand the subject, report the observed condition to have management check for a hot basin. However, it’s important to talk to someone knowledgeable, generally not “kids” who work afternoons/weekends. If staying at a facility as an overnight or short-term transient guest and only “kids” are available, call back to the office later and talk to someone who is knowledgeable, or at least responsible enough to pass the concern on to someone who is knowledgeable. For long-term facility stays, boat owners should periodically check their own cords and those of immediate dock neighbors. If all of these cords show non-zero fault currents flowing, perform Tests 9A thru 9C. Report positive 9C findings to a responsible facility employee to have the basin checked. For long-term facility stays, boat owners should periodically check their own cords as other transient boats come and go. I have been able to identify boats with ground-fault problems just by screening my own cords. If a “hot boat” slips near me, I’ll see that in the readings of my own known-good cords. An AC fault current flowing in the water of a boat basin generally won’t hurt the underwater metals of boats, but because current is flowing through the water, it is obviously dangerous to swimmers and pets. NEVER SWIM IN A MARINA BASIN, AND NEVER ALLOW CHILDREN OR PETS TO DO SO! Divers, beware always! This entry was posted in AC Safety Tests for Boats, Boat AC Topics on 2015/05/18 by gilwellbear. A significant AC electrical concern is emerging for some owners of older boats. For those who may be, or are affected, I urge you to investigate sooner rather than later. Land-based building and construction codes are usually implemented through government rule-making and have the force of law. In the United States, the National Fire Protection Association (NFPA) is a private fire safety association that creates and maintains the US National Electric Code (NEC). In Canada, the Canadian Standards Association (CSA) maintains C22.1, and various other departments maintain industry specific Canadian Electric Codes. In the US, the NEC is updated and published on a three-year cycle. The most current version was published in 2014. Across the United States, the 50 individual states, and many counties and municipalities, “adopt” the NEC as their construction and building standard. Adoption occurs at random intervals and varies from locale-to-locale. Code enforcement is through the permitting process, and designated local code enforcement officers called the “authority having jurisdiction;” the “AHJ.” Today, some jurisdictions are operating on the 2008 NEC, some on 2011 and some on 2014. People who own properties in multiple states may indeed be working with different versions of the NEC. For boats and boat owners, there are no “permitting” processes for performing upgrades, and there are no official “authorities having jurisdiction.” The only “codes” that apply to pleasure craft are very limited federal requirements (enforced by the United States Coast Guard) and a very broad set of voluntary standards developed by the American Boat and Yacht Council (ABYC). Principally for pleasure craft, the standards of the ABYC take precedence. The ABYC electrical standards align and integrate tightly with land-based codes, except that compliance is “voluntary.” As boaters, the closest we come to any kind of formal “code enforcement” is through the business requirements of a lender or, more commonly, an insurance carrier. To obtain hull insurance, boaters usually obtain a “survey.” If a surveyor identifies a discrepancy or noncompliance to one of the provisions of the ABYC standards, the lender or marine insurance carrier may require the boat owner to implement corrective measures. However, in practice, this process is flawed in significant ways. Most surveyors are not expert in assessing AC electrical systems, and are unlikely to check for, or detect, AC ground fault or related current leakage issues. Since compliance is voluntary for the boat owner, nothing is actually required for those owners who choose to self-insure. Periodic surveys are not required by law. ABYC compliance is not a legal requirement but rather, is loosely and inconsistently based on the business transaction between individual boat owners and the various marine insurers. The scope statement of the National Electric Code, Article 555, is “… the installation of wiring and equipment for fixed or floating piers, wharfs, docks, and other areas in marinas, boatyards, boat basins, boathouses, and similar occupancies. This article does not apply to docking facilities or boathouses used for the owners of single-family dwellings.” The equivalent language in the scope statement of the National Fire Protection Association standard (303, Chapter 5, 5.1.1) is: “This standard applies to the construction and operation of marinas, boatyards, yacht clubs, boat condominiums, multiple-docking facilities and multiple-family residences, and all associated piers, docks and floats.” In the NEC, the term “similar occupancies” include yacht clubs, condominium docks, restaurant docks, etc. Because land-based codes are mandatory but boat codes are voluntary, there is an emerging issue (in 2015 and later) for boat owners, and definitely for owners of older boats, at all non-single family, residential docks. These defined facilities are the point where the voluntary compliance requirements of cruising and transient boats interface through the shore power cord with the mandatory requirements of the land-based NEC. We as boat owners are squarely in the middle. The average age of one fleet with which I am familiar is 27 years. Across that span of years, electrical standards, materials and best-practices have all evolved significantly. Across those years, many “previous owner modifications” may have been made to a boat’s AC electrical system, and perhaps not always implemented “in the right way.” Furthermore, some boats built new, offshore, contain equipment choices selected for cost and do not comply, new, out-of-the-box, with ABYC requirements. And finally, across the years, systems and components can deteriorate and fail, sometimes in obscure and non-symptomatic ways, invisible to and hidden from the boat owner. The issue to which older boats in particular are exposed, then, is that they may have one or more true ground faults and/or leakage faults aboard. Simply put, boats that are not compliant with the 2012 and 2015 versions of ABYC E11 will be INCOMPATIBLE – by definition and in fact – with the shore-side requirements of the 2011/2014 National Electric Code for ground fault protection on docks. The National Electric Code, Article 555.3 (entitled: Ground Fault Protection) says: The main over-current protective device (OPD) that feeds the marina shall have ground fault protection not exceeding 100mA. Ground-fault protection of each individual branch or feeder circuit shall be permitted as a suitable alternative. 3. EACH PEDESTAL would have a “home run” to the mains distribution panel, and EACH INDIVIDUAL PEDESTAL would be protected at no more than 100mA. 1. Item 1 is the least capital intensive for the facility to install, but it is also the most troublesome. 2. Item 2 is middle-of-the-road from the perspective of capital cost to install, and middle-of-the-road for being troublesome. 3. Item 3 is the most capital intensive and the least troublesome. When I use the word “troublesome” above, I am referring to the fact any boat with a ground fault will trip the feeder to which it connects. So in case 1, a single boat with a ground fault will take down the entire dock. In case 2, a single boat with a ground fault will take down a cluster of slips. In case 3, a single boat with a ground fault will only affect one pedestal, but NOT its neighbors. Obviously, for a large marina intending to support a largely transient customer base, case three would be the conservative, preferred option to ensure uninterrupted electrical service to its customers. In a private club or condo dock, where there is virtually no transient traffic, a less conservative approach may be acceptable. Obviously, the least risk of service disruption is associated with the greatest capital maintenance costs. In light of the above, consider a cruising boat with a hidden ground fault that arrives at a newly upgraded, NEC-compliant marina or boatyard. If that boat has a ground fault aboard, it is possible for that transient boat to bring down an entire dock, or a cluster of neighboring slips. In that case, some number of “innocent” neighboring boats will be negatively affected; that is, they will all lose power. A boat wired in compliance with the 2012 ABYC E11 standard will not have undetected ground faults. New production boats manufactured after 2012 must have ELCI devices installed. New boats and those retrofit with ELCI devices aboard will not have hidden ground fault problems. However, many older boats do not – maybe never did – meet the ABYC E11 standard, and there is no legal requirement that they be retrofit to comply. Therefore, ALL FACILITIES that comply with the 2011/2014 NEC for Article 555.3 WILL ENCOUNTER ground fault issues with some number of transient boats. What that also means is the owner of a boat with a ground fault condition will be more and more often exposed to not having power in newer, more modern facilities. And obviously, the owner of the boat that is the cause of a loss of power on a dock will not be a very popular or welcome guest. I would guesstimate at least 10% to 20% of older boats could have true ground faults, either by wiring performed by the previous owner(s) or by now-obsolete OEM equipment installed years ago at time of manufacture. Some argue for a much higher number, but whatever the real number, it is significant. Just yesterday (end June, 2015), I walked a dock at my home yacht club with a clamp-on ammeter. I found at least one boat with two 120V shore power cords and co-mingled neutrals. I found at least 6 boats leaking more than 100mA into the water. All of those boats would cause a GFP device with a 100mA set point to trip and disconnect power to their boat. Finally, for the individual owner of an older boat who happens NOT to be an electrical geek, there may be significant time and expense in hiring a marine-certified electrical technician capable of correcting ground fault problems on boats! The development of the National Electric Code is a methodical and disciplined process. Change proposals require many months or years of study and consideration before they are adopted. The next release of the NEC (NFPA 70) is scheduled for 2017. On November 5, 2014, ABYC submitted a proposal entitled “Assessment of Hazardous Voltage/Current in Marinas, Boatyard and Floating Buildings” to NFPA which recommends requiring GFCI outlets on all marine pedestals. Pedestal outlets under this proposal would be spec’ed at 30mA for 100mS. Assuming this is adopted by NFPA (Section 303, Chapter 5) and incorporated into the NEC (Articles 553 and 555), it would probably speed the overall rollout of GFP on docks, as it is much easier and less expensive than the whole dock solutions discussed above as provided in today’s standards. Boats fit with an isolation transformer are generally free from worrying about all this. With an isolation transformer, the shore power ground stops at the transformer, where it connects to an internal shield that is electrically isolated from the transformer’s case. The case of the physical transformer is connected to the boat’s onboard AC safety ground. ABYC E11 treats the secondary (output side) of an isolation transformer as an on-board power source, like a genset or an inverter. The primary (Input side) of the isolation transformer is fed from the dock pedestal. The secondary (output side of the transformer) has its neutral and ground conductors bonded (connected together) at the transformer. With an isolation transformer, there is no through electrical connection between the shore power ground and the boat’s on-board grounding system. There is one significant “EXCEPT” to the isolation transformer story. If a wired telephone, wired Ethernet or shielded TV cable is ever brought onto the boat, the ground conductors in those cables create an electrical path between the shore power ground and the boat’s on-board electrical grounding system; that is, they bridge the gap that was deliberately created by the design of the isolation transformer. So, first, boat owners MUST ALSO have galvanic isolator devices installed in ALL OF THOSE CABLES in order to create the physical separation gap in the ground path. These isolators can be of the magnetic or optical coupling design. The Cable TV galvanic isolator is easy; $10 off the Internet. Isolators are made for the other cables, but may be pricey. Second, if a boat with an isolation transformer does have a ground fault in its on-board wiring, the boat will trip a GFP at the time one of those (telephone/Ethernet/Cable TV) “bypassing shore ground paths” is connected. The risk of this is low, but not zero. Third, because the wires in telephone and Ethernet circuits are physically small, if there are hidden ground fault wiring errors on the boat, those physically small wires may act like fuses, and open. There is also the potential of damage to attached electronics. Again, the risk is low, but not absolute zero. Investigate the status of your older boat now! If you have this problem, it is only a matter of time before it bites you! This entry was posted in Emerging AC Electrical Concern on 2015/04/29 by gilwellbear. A “built-in” genset can be a valuable amenity on any boat, but especially on a cruising boat. The need for a generator, like the need for air conditioning, space heating or a watermaker, depends on the personal preferences and the anticipated needs of the boat owner. In the case of a generator, considerations include the need to operate a battery charger away from shore power, use of 120VAC aboard, anchoring vs. marina preference, availability and costs of mooring fields vs. transient docks in planned cruising destinations, geographical range of intended cruising waters, etc. If a boat’s battery bank is sufficiently sized, and the boat is moving by propulsion engine each day, battery charging from the propulsion engine alternator may be sufficient to deliver and meet AC electric energy needs, via an inverter. Especially so if AC electrical needs aboard are modest. Gensets can power larger loads like reverse cycle heat pumps for air conditioning and space heating. They can power emergency de-watering pumps, battery chargers, AC refrigeration, range/ovens, watermakers, washer/dryers and entertainment devices. They can provide emergency dockside power when commercial utility power goes away. They enable long term anchoring and the use of mooring balls in New England and Florida Keys destination towns, and along the shores of the Canadian Canal Systems. We aboard Sanctuary used our genset for refrigeration, heat and TV for several days in the aftermath of Hurricane Sandy, prior to the restoration of commercial utility power. There are two choices of generator type that can be used very effectively on boats and in RVs. The most common choice is the combination of an alternating current (AC) alternator driven by a gasoline or diesel motor. Speed-of-rotation must be held constant – preferably 1800 rpm – to produce stable 60 Hz AC output. Speed control is generally accomplished with a mechanical governor that responds to changes in electrical load by adjusting the throttle of the drive motor. Generators are readily available in sizes of 7.5/8.0 kilowatts (kW), suited to boats with 2, 120V, 30A shore power circuits, or 12 kW, suited to boats with a single 240V, 50A shore power circuit. 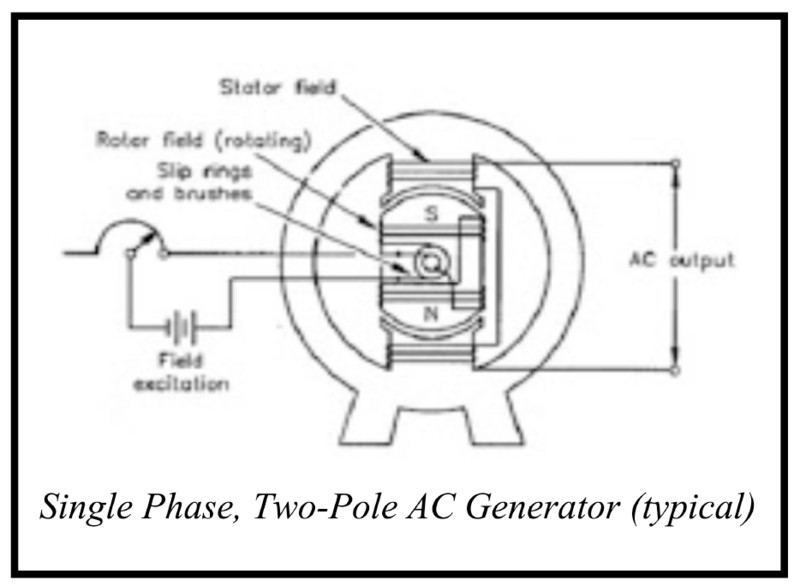 The second type of AC generator consists of an automotive style alternator (DC output) driven by a gasoline or diesel motor. “DC generators” have internal electronic inverters that convert the DC produced by the alternator to 120V and/or 120V/240V AC at 60 Hz, usually in pure sine wave (PSW) form. These machines use high output DC alternators such as those used in commercial trucks and emergency vehicles, and produce +12V or +24V DC output. The design of DC gensets is mechanically less complex than AC alternators. The motor’s speed-of-rotation is not important to AC output frequency. Batteries can be charged directly from the 12V (or 24V) alternator output. Regardless of the choice of technology, when installing a generator on a boat, be sure to purchase equipment that complies with the ABYC A27, Alternating Current (AC) Generator Sets electrical standard. Use marine rated materials and installation techniques that comply with the ABYC E11, AC & DC Electrical Systems on Boats electrical standard. Use marine-certified electrical technicians to perform any contracted installation work. The life you save by doing so may be your own, your children or grandchildren, contractors working on your boat, and/or your family pet(s). a single 50A shore power service cord. Doing the math for 30A services, the capacity of a single 30A shore power service is up to (30A x 125VAC) = 3750 Watts. A boat with two 30A services could use up to 7500 watts (7.5kW) of capacity at one time. Thus, a genset capable of a continuous output of 7.5kW would be needed to fully power everything aboard to the same level as available with shore power. Since 7500 watts at any one time is rarely needed, a 5kW machine might be an acceptable compromise, but would limit flexibility in maximum case situations. It does not allow for any further future expansion of simultaneous electrical load or for changes in how the Admiral may want to alter electricity use patterns in future months/years. The capacity of a single 50A shore power service is up to (50A x 240VAC) = 12000 Watts (12kW) to fully power onboard AC electrical equipment. Thus, a genset capable of a continuous output of 12kW is required to fully power everything aboard to the same level as available with shore power. Aboard Sanctuary, we do occasionally want to have nearly the maximum amount of AC electric power. That happens when we’re running the heat pumps for either A/C or heat, and when we’re also charging our batteries and simultaneously heating hot water and running the microwave. It’s obvious that this does not happen often, but it can and does happen, usually when we’re in a hurry to depart the boat for other (sightseeing) pursuits. That use could be balanced over time, of course; that is, if the time is available. Unusual AC electrical equipment, like a washer/dryer, high-pressure pump of a watermaker or an air compressor, would also influence the foregoing load-planning scenario. Motor driven appliances introduce two technical considerations. First, they require dramatically higher currents to start the motor turning than they require to keep the motor running. The generating equipment must be able to handle that transient, short-period (peak) load. Second is a technical issue called “Power Factor.” In general, the implication of power factor is that larger ampacity wiring and higher capacity generating equipment is necessary to support the nominal load, often in the range of 20% greater than nominal. If this type of equipment is to be run by an onboard generator, special consideration must be given to wiring and steady-state power requirements. If one decides to install a traditional rotating-alternator AC genset, I recommend gensets that spin at 1800 rpm vs 3600 rpm to product 60 Hz output. These small engine generators spin at 1800 (four-pole) or 3600 (two-pole) revolutions per minute (rpm) depending on the number of field poles of the stator design. Four-pole alternators are preferred to two-pole machines. The 1800 rpm speed-of-rotation of a four-pole machine offers longer service life and is quieter in operation. easier parts replacement – especially major components – if/when maintenance is required (dependent on manufacturer; go with one that uses non-proprietary components). With either native AC alternators or DC-inverter hybrids, I recommend diesel-powered drive engine units. *NEVER* gasoline! And, *NEVER* Honda EU2000 or big box household portable units on boats! the selection of Generator Transfer Switch will depend on how you choose to wire the genset (as a 120V machine or a 240V machine; ours aboard Sanctuary is wired as a 240V machine. There are pros and cons about that choice). electrical and mechanical skills are required to do this task. It can be done as a DIY project of advanced complexity. With time availability and skills, significant labor dollars can be saved on the installation. Labor hours will be significant: 40~50 hours, minimum. I did all the installation work for our genset myself. It took a couple of weeks elapsed time; not full days, just tasks interspersed with other projects and tasks. the AC wiring, DC starter motor wiring, raw water plumbing and diesel fuel supply and return lines will have to be custom-fabricated. a fiberglass waterlock will cost around $150. the Generator Transfer Switch (I used a Blue Sea Systems #9093) was the single most expensive component part, at $350 in 2004.
for AC power wiring, I used a length of 50A shore power cord, #6 AWG, BC5W2, triplex because of the convenience of handling that multiplex wiring package. Finally, to minimize the number of current and future hull penetrations, consider a single large raw water inlet with a single, large sea strainer, feeding a raw water distribution manifold (“sea chest”). This entry was posted in Genset Installation on 2015/04/29 by gilwellbear.